The violin consistently seems to have brought out of Bartók a special combination of lyrical intensity, brilliance and ingenuity. Partly this is because the instrument is so central to the folk music that Bartók adored. But Bartók also had the fortune to be closely associated with first-rate violinists: for the Hungarian virtuoso Yelly d’Aranyi he wrote his two violin-and-piano sonatas in 1921 and 1922, and for his other compatriot friends Jószef Szigeti and Zoltán Székely he composed the two violin Rhapsodies, again as a complementary pair, in 1928. Szigeti and Székely were much more than just performing dedicatees, for their particular skills and creative ideas had a strong effect on not only Bartók’s violin writing but also other facets of his creative output. It was Székely who had the idea of transcribing the six Rumanian Folk Dances for violin and piano from Bartók’s original piano setting, and who later commissioned Bartók’s second Violin Concerto. In turn Szigeti, with whom Bartók gave many concerts, came into his own during the difficult last years of Bartók’s life, quietly and sometimes secretly securing for his friend major commissions, including the Contrasts and Concerto for Orchestra. Bartók generally viewed his music as falling into two categories – either settings of existing folk music, or completely original compositions that nonetheless took their inspiration and melodic nature from folk music. It seems that he found this a fertile combination, the authentic folk material standing as a yardstick beside his own inventions as well as permeating the spirit of the latter. His six Rumanian Folk Dances of 1915 are one of the clearest examples of the first category, folk tunes set initially for piano in a manner simple enough for competent children to play. Székely, doubtless sensing that some of them were in the first place fiddle tunes, made the present transcription in 1925, with Bartók’s full approval. He may also have had Bartók’s collaboration, for the transcription includes a few changes of key from Bartók’s piano setting, as well as embellished repetitions and elaborated textures. Bartók accompanied this version himself on several occasions, and recorded it with Szigeti in 1930. The nature and sequence of the dances are of some interest, and most information about them comes from Bartók’s students. The first piece is a stick dance, the sticks garlanded with flowers; according to different accounts it is danced by either boys (who kick towards the ceiling) or by older men (who bang the floor). The second dance features sashes or waistbands, and the third, to a flute melody, is danced on the one spot. The remaining three are probably gypsy fiddle melodies, identified respectively by a place name, as a Rumanian polka, and as a dance that takes small or short steps. Some of Bartók’s pupils recount a further thread to the sequence, as scenes from a country wedding. In particular the flautist of the third dance is the shepherd bridegroom himself, the singer of the fourth (rather than violinist) is the bride-to-be, the Rumanian polka is danced by the men only, and the final dance is a general rejoicing. Bartók regarded his two violin Rhapsodies as basically folk music arrangements, but their more elaborate forms are of his own composition. Both of them build on the standard gypsy csárdás sequence of lassú and friss (slow and fast) and use mostly Rumanian folk tunes from Transylvania, though with some added colouring from Hungarian and Ruthenian melodies. Otherwise they make quite a contrast, the first Rhapsody more swashbuckling in its opening lassú (perhaps telling a tall tale, judging by the ‘Hungarian sneezes’ of disbelief that punctuate it), the second Rhapsody more alluring and mysteriously passionate. However, the second Rhapsody is the wilder of the two in its friss, starting from a stamping barn dance and progressively daring itself to ever more hair-raising feats. 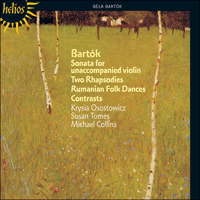 In the character of folk music, Bartók found it hard to decide how to end either Rhapsody. Szigeti claimed that his manuscript copy of the first Rhapsody contains thirty-nine unpublished bars, and even the published score offers a choice of two endings (the present recording uses the first, and Bartók and Szigeti recorded the piece twice with the second). The second Rhapsody also began life with a longer ending, printed in early editions before being revised in 1945 to the version heard here. For Contrasts we have to thank the fertile and loyal imagination of Szigeti – or in his own words ‘a brainstorm I had in 1938’ – which resulted in him persuading the jazz clarinettist Benny Goodman to commission a trio from Bartók. Originally the plan was for another two-movement Rhapsody in the lassú–friss format, each movement capable of fitting on one side of a 78rpm disc. This, indeed, was how the work was first billed and performed in January 1939, at a New York concert by Goodman, Szigeti and Endre Petri. By 1940, when Bartók joined Goodman and Szigeti for a Carnegie Hall concert and a gramophone recording, the work had acquired its present title (decided together by Bartók and Szigeti one evening on Park Avenue) and, more importantly, its central ‘Pihenö’ movement (literally, ‘Taking a rest’; in this case an evocative outdoor nocturnal scene, coloured by a few suggestions of Indonesian gamelan). Clowning is rarely far from Bartók’s music, despite its over-austere reputation. Among the outright gags in Contrasts, the first movement contains an unmistakable parody of a wind-up gramophone running down – perhaps an impish reference to the work’s terms of commission, combined with memories of Bartók’s years of folksong collecting on wax cylinders? Similarly, the mistuned violin that opens the finale may be mostly peasant ribaldry, but could just also be a facetious prod at Saint-Saëns. As the burlesque gets properly under way the violinist changes to a properly tuned instrument, while the others literally twiddle their thumbs or fingers, repeating a trite little ostinato figure ad libitum until the violinist is ready to continue. In the middle of the finale’s romp, though, lies one of Bartók’s most haunting inspirations, an extended lyrical episode set in ‘Bulgarian’ 13/8 metre divided 3+2+3+2+3 – in effect a delicious type of elaborated rumba. For much of 1943, isolated and unhappy in the USA, Bartók was dangerously ill with a fever that was probably the onset of his fatal leukaemia. Discreet help from Szigeti and others allowed him some rest and financial security, and in the autumn, somewhat recovered, he heard the young Yehudi Menuhin play his second Violin Concerto and first Violin Sonata in separate concerts in New York. Bartók was overjoyed not only to hear his music played at all, but so well: on meeting Menuhin he exclaimed that he had always thought music only received such performances long after its composer’s death. Menuhin promptly commissioned a solo violin work, and Bartók’s health stabilized enough over winter for the present solo Sonata to be completed by 14 March 1944. That and the third Piano Concerto were the last two works whose music Bartók completed; at his death in 1945 both works remained not fully edited for publication. Bartók had the consolation of hearing Menuhin give the solo Sonata’s premiere in ‘a wonderful performance’ in November 1944, just a few days before another magnificent premiere, that of his Concerto for Orchestra. In its four-movement span the solo Sonata is one of the largest musical risks Bartók ever took; in his own words after the premiere, ‘I was afraid it was too long; imagine … a single violin for twenty minutes. But it was quite all right, at least for me’. If the titles of its first two movements suggest Bach, those of the last two suggest folk tradition; in reality all four movements blend folk and Classical tradition with breathtaking virtuosity. In specifying ‘Tempo di ciaccona’ Bartók took the additional risk of making the first movement not literally a chaconne (it only follows chaconne tempo) but a full-scale sonata structure. As in earlier years with Székely and Szigeti, Bartók left Menuhin some freedom in details of performance, offering a few alternative readings, particularly in the finale where a substantial passage can be played either with quarter-tone intervals or more conventionally in semitones. Menuhin chose the latter, and this reading was adopted in the work’s publication after Bartók’s death. More recently Bartók’s initial quarter-tone version has become available, and can be heard on the present recording. Le violon semble immanquablement avoir mis en valeur chez Bartók un combinaison spéciale d’intensité lyrique, d’éclat et d’ingénuité, ce qui est en partie dû à la place si centrale occupée par cet instrument dans la musique folklorique que Bartók adorait. Mais aussi au fait que Bartók avait la chance d’être en association étroite avec des violonistes de premier ordre: c’est pour le virtuose hongrois Yelly d’Aranyi qu’il écrivit ses deux sonates pour violon et piano en 1921 et 1922, et c’est pour ses autres compatriotes et amis, Jószef Szigeti et Zoltán Székely, qu’il composa, en 1928, les deux Rhapsodies pour violon, une autre paire complémentaire. Szigeti et Székely étaient bien plus que de simples exécutants auxquels cette musique était dédiée, car les talents et idées créatrices qui leur étaient propres eurent des effets fortement marqués non seulement sur la composition musicale pour violon de Bartók, mais aussi sur d’autres facettes de sa production créatrice. Ce fut Székely qui eut l’idée de transcrire les six Danses folkloriques roumaines afin de transformer l’arrangement original pour piano de Bartók en arrangement pour piano et violon, et qui, plus tard, fit la commande à Bartók du deuxième concerto pour violon. A son tour, Szigeti, en compagnie duquel Bartók donna de nombreux concerts, montra sa valeur pendant les difficiles années qui marquèrent la fin de la vie de Bartók, travaillant en silence et parfois même en secret à procurer à son ami des commandes majeures, parmi lesquelles Contrasts et le concerto pour orchestre. Bartók pensait généralement que sa musique tombait en deux catégories – soit des arrangements effectués sur une musique folklorique existante, soit des compositions totalement originales qui dérivaient leur inspiration et nature mélodique de la musique folklorique. Il semble qu’il ait trouvé cette combinaison fertile, le matériel folklorique authentique étant à la fois l’aune à laquelle se mesuraient ses propres inventions et l’inspiration qui imprégnait ces dernières. Ses dix Danses folkloriques roumaines de 1915 constituent un des exemples se rattachant le plus clairement à la première catégorie, des airs folkloriques arrangés initialement pour piano avec suffisamment de simplicité pour être joués par des enfants compétents. Székely, sentant sans aucun doute que certains de ces airs étaient en premier lieu des airs pour violon, effectua la transcription présente en 1925, avec la complète approbation de Bartók. Il se peut qu’il ait aussi bénéficié de la collaboration de ce dernier, car la transcription comprend quelques changements de clé par rapport à l’arrangement pour piano de Bartók, ainsi que des répétitions enjolivées et des structures élaborées. Bartók accompagna lui-même cette version en plusieurs occasions et en fit l’enregistrement avec Szigeti en 1930. La nature de ces danses et leur succession présentent de l’intérêt, du fait que la majorité des informations les concernant proviennent des élèves de Bartók. Le premier morceau est une danse de bâtons, exécutée avec des bâtons enguirlandés de fleurs: suivant les explications qui diffèrent, cette dernière serait soit dansée par de jeunes garçons (qui lanceraient la jambe vers le ciel) soit par des hommes plus âgés (qui frapperaient le sol). La seconde danse se figurer écharpes et ceintures, et la troisième se danse sur place, sur un air de flûte. Les trois dernières sont probablement des airs de violon gitans, identifiées respectivement par un nom de lieu, puis comme une polka roumaine et finalement comme une danse qui s’exécute à petits pas ou à pas brefs. Dans leur récits, certains élèves de Bartók font mention d’une autre explication à cette suite: ce seraient les scènes d’un mariage de campagne. En particulier, le joueur de flûte de la troisième danse serait un berger, le marié en personne, la chanteuse de la troisième (au lieu de violoniste) serait la future mariée (la polka roumaine n’est dansée que par les hommes) et la danse finale serait la réjouissance générale. Bartók regardait essentiellement ses deux Rhapsodies pour violon comme des arrangements de musique folklorique, néanmoins leurs formes au caractère plus élaboré sont de sa propre composition. Toutes deux s’appuient sur la csárdás gitane traditionnelle, une succession de lassú et friss (lent et rapide), et utilisent surtout des airs folkloriques roumains originaires de Transylvanie, avec néanmoins un rehaut de couleur provenant de mélodies hongroises et ruthènes. Ceci mis à part, elles contrastent fortement, la première Rhapsodie présente des accents plus fanfarons dans son lassú d’ouverture (qui raconte peut-être une histoire à dormir debout, si on en juge par les éternuements hongrois, signes d’incrédulité qui la ponctuent), la deuxième Rhapsodie est plus attrayante et mystérieusement passionnée. Néanmoins, c’est la deuxième Rhapsodie qui, de par son friss, se montre la plus endiablée, commençant comme une danse paysanne où l’on frappe du pied et osant progressivement atteindre des prouesses autrement plus affolantes. Du fait du caractère de la musique folklorique, Bartók éprouva de la difficulté à décider d’une fin pour chacune des deux Rhapsodies. Szigeti affirmait que son exemplaire manuscrit de la première Rhapsodie contenait 39 mesures inédites, et la partition publiée offre elle-même le choix de deux finales (le présent enregistrement utilise la première finale, tandis que Bartók et Szigeti enregistrèrent deux fois le morceau avec le seconde). Au début de son existence, la deuxième Rhapsodie comprenait aussi une finale plus longue qui fut imprimée dans les premières éditions avant d’être révisée en 1945 pour arriver à la version que nous présentons ici. Pour Contrasts, il nous faut rendre hommage à l’imagination loyale et fertile de Szigeti, ou, selon ses propres paroles, «une idée géniale» qu’il aurait eu en 1938, et à la suite de laquelle il persuada le clarinettiste de jazz, Benny Goodman, de faire la commande d’un trio à Bartók. A l’origine, il était prévu de créer une autre rhapsodie en deux mouvements du type lassú–friss, dont chaque mouvement aurait la durée requise pour figurer sur la face d’un disque à 78 tr/mn. C’est en effet sous cette forme que cette œuvre fut d’abord mise à l’affiche puis exécutée en janvier 1939 par Goodman, Szigeti et Endre Patri, lors d’un concert tenu à New York. En 1940, lorsque Bartók se joignit à Goodman et Szigeti pour donner un concert à Carnegie Hall et procéder à un enregistrement, l’œuvre avait déjà acquis son titre présent (à la suite d’une décision prise en commun par Bartók et Szigeti un soir, sur Park Avenue) et, ce qui est le plus important, son mouvement centrale «Pihenö» (littéralement, «prenant du repos»; dans ce cas, une scène nocturne de plein air rehaussée par quelques accents de gamelan indonésien). Les pitreries sont rarement éloignées de la musique de Bartók, malgré sa réputation d’extrême austérité. Parmi les purs gags présents dans Contrasts, le premier mouvement comprend la parodie indubitable d’un phonographe à manivelle en train de s’arrêter – peut-être est-ce une référence espiègle aux conditions de travail imposées par la commande, à laquelle s’ajoutait le souvenir des années passées par Bartók à recueillir des chants folkloriques sur rouleaux de cire. De même, il se peut que le violon désaccordé qui ouvre le finale soit surtout un signe de paillardises paysannes, mais il est tout aussi possible que ce soit un facétieux coup d’aiguillon à Saint-Saëns. Alors que le burlesque commence à prendre tournure, le violoniste décide d’utiliser un instrument proprement accordé, tandis que les autres se tournent littéralement les pouces en répétant à volonté un petit ostinato banal en attendant qu’il soit prêt à continuer. Au milieu des ébats du finale se trouve néanmoins une des inspirations les plus envoûtantes de Bartók, un long épisode lyrique en 13/8, mesure bulgare qui se décompose en 3+2+3+2+3 – en fait un type exquis de rumba élaborée. Pendant la majeure partie de 1943, Bartók qui se sentait isolé et malheureux aux USA était dangereusement malade, souffrant d’une fièvre qui était probablement le début de la leucémie qui allait l’emporter. Une aide discrète apportée par Szigeti et d’autres lui permit de trouver repos et sécurité financière, et à l’automne, après avoir quelque peu recouvré la santé, il écouta le jeune Yehudi Menuhin jouer son deuxième concerto pour violon et sa première sonate pour violon dans des concerts séparés à New York. Bartók fut non seulement ravi par le fait même que sa musique fut jouée, mais surtout par le fait qu’elle fut si bien jouée: lorsqu’il fit la connaissance de Menuhin, il s’exclama qu’il avait toujours cru que la musique d’un compositeur ne recevait ce genre d’interprétation que longtemps après la mort de ce dernier. Menuhin fit promptement la commande d’une œuvre pour violon en solo, et la santé de Bartók se stabilisa suffisamment pendant l’hiver, pour que la présente Sonate pour solo soit terminée le 14 mars 1944. Cette dernière ainsi que le troisième concerto pour piano, furent les deux dernières œuvres dont Bartók acheva la musique; à sa mort, en 1945, l’édition des deux œuvres qu’il avait entreprise en vue de leur publication, restait incomplète. Bartók eut la consolation d’assister à la première de la Sonate pour solo à laquelle Menuhin donna «une interprétation merveilleuse», en novembre 1944, à peine quelques jours plus tard, à une autre première superbe, celle de son concerto pour orchestre. La Sonate pour solo, dont la durée s’étend à quatre mouvements, constitue un des risques musicaux les plus importants que Bartók ait jamais pris: il reconnut lui-même après la première: «Je craignais qu’elle ne soit trop longue. Imaginez … un seul violon pendant vingt minutes. Mais c’était très bien, au moins en ce qui me concerne.» Si les titres des deux premiers mouvements rappellent Bach, ceux des deux derniers rappellent la tradition folklorique; en réalité, les quatre mouvements allient tous tradition folklorique et tradition classique avec une virtuosité qui coupe le souffle. En spécifiant «Tempo di ciaccona», Bartók prit le risque supplémentaire de ne pas faire du premier mouvement un chaconne littérale (il ne suit que le tempo du chaconne) mais d’en faire une structure intégrale de sonate. Comme il l’avait fait quelques années auparavant avez Székely et Szigeti, Bartók laissa à Menuhin une certaine liberté dans les détails de l’exécution, lui offrant plusieurs lectures possibles, particulièrement dans le finale où un passage important peut être joué soit avec des intervalles en quart de ton soit en demi-ton. Menuhin choisit cette dernière possibilité, et c’est cette lecture qui fut adoptée dans la publication de l’œuvre après la mort de Bartók. Plus récemment, la version initiale en quart de ton de Bartók est devenue disponible et c’est celle vous entendrez dans cet enregistrement. Die Violine scheint ständig bei Bartók eine besondere Kombination von lyrischer Intensität, Brillanz und Einfalsreichtum hervorgelockt zu haben. Dies liegt zum Teil daran, dass das instrument so im Mittelpunkt der Volksmusik steht, die Bartók über alles liebte. Aber Bartók hatte ebenfalls das Glück, mit erstklassigen Geigenspielern in enger Verbindung zu stehen: Für den ungarischen Virtuosen Yelly d’Aranyi schrieb er 1921 und 1922 seine zwei Sonaten für Violine und Klavier, und für seine anderen Landsleute und Freunde Jószef Szigeti und Zoltán Székely komponierte er 1928 dei zwei Violinrhapsodien, wiederum als ein sich ergänzendes Paar. Szigeti und Székely waren viel mehr als Virtuosen, die die ihnen gewidmete Musik voertrugen, denn ihre besonderen Kunstfertigkeiten und kreativen Ideen hatten einen starken Einfluss, nicht nur auf Bartóks Violinkompositionen, sondern auch auf andere Aspekte seines schöpferischen Werks. Es war Székely, der auf den Gedanken kam, die sechs rumänischen Volkstänze für Klavier zu transkribieren, und später Bartók viele Konzerte gab, zeigte seinerseits in den schweren letzten Jahren von Bartóks Leben, was in ihm steckte, und sicherte unauffällig und manchmal im geheimen grössere Aufträge für seinen Freund, darunter dir Kontraste und das Konzert für Orchester. Nach Bartóks Meinung fällt seine Musik in zwei Kategorien – entweder Bearbeitungen von vorhandener Volksmusik oder vollständig ursprüngliche Kompositionen, die allerdings ihre inspiration und den melodischen Charakter aus der Volksmusik nahmen. Es scheint, dass er dies als eine fruchtbare Kombination ansah: Das authentische Volksmaterial, das den Massstab für seine eigenen Erfindungen setzte und gleichzeitig deren Geist durchdrang. Seine sechs rumänischen Volkstänze aus dem Jahre 1915 sind eins der deutlichsten Beispiele für die erste Kategorie, Volksweisen, die zuerst auf eine so einfache Weise für das Klavier arrangiert wurden, dass fähige Kinder sie spielen konnten. Székely, der zweifellos fühlte, dass einige von ihnen Bartóks Klavierarrangement sowie einige ausgeschmückte Weiderholungen und ausgearbeitete Strukturen ein. Bartók begleitete diese Version selbst bei mehreren Gelegenheiten und machte 1930 mit Szigeti eine Aufnahme. Natur und Folge der Tänze sind von einigem Interesse, da die meiste Information über sie von Bartóks Schülern kommt. Das erste Stück ist ein Steckentanz, bei dem die Stecken mit Blumen gegränzt sind: Nach verschiedenen Berichten wird er entweder von Knaben getanzt (die die Beine zur Decke hochwerfen) oder von älteren Männern (die auf den Boden klopfen). Der zweite Tanz enthält Schärpen oder Hosenbänder, und der dritte wird nach einer Flötenmelodie auf der Stelle getanzt. Die übrigen drei sind wahrscheinlich Zigeunergeigenmelodien, die durch einen Ortsnamen bzw. als eine rumänische Polka und schliesslich als ein Tanz, der kleine oder kurze Schritte erfordert, gekennzeichnet werden. Einige Schüler Bartóks erzählen von einem weiteren, die Tanzsequenz durchziehenden roten Faden, von Szenen aus einer ländlichen Hochzeit. So ist ihm besonderen der Flötist im dritten Tanz Schäfer und Bräutigam selbst. Die Sängerin im vierten Tanz (wahrscheinlicher als die Geige) ist die zukünftige Braut; die rumänische Polka wird von männern allein getanzt, und der abschliessende Tanz ist Ausdruck allgemeinen Jubelns und Feierns. Bartók betrachtete seine zwei Violinrhapsodien gründsätzlich als Arrangements von Volksmusik, doch ihre kunstvollere Formen sind seine eigene Schöpfung. Beide bauen auf der üblichen Zigeuner-Csárdásfolge von lassú und friss (langsam und schnell) auf und benutzen meist rumänische Volksweisen aus Transsilvanien, wenn auch mit einem zusätzlichen Kolorit ungarischer und ruthenischer Melodien. Ansonsten bilden sie einen rechten Kontrast. Die erste Rhapsodie ist in ihrem einleitenden Lassú verwegener (vielleicht erzählt sie, den Unglauben ausdrückenden „ungarischen Niesern“ nach zu urteilen, die sie punktieren, eine phantastische Geschichte), die zweite Rhapsodie ist eher verführerisch und voll geheimnisvoller Leidenschaft. Die zweite Rhapsodie ist jedoch in ihrem Friss die wilderere von beiden. Sie beginnt mit einem gestampften Bauerntanz und riskiert nach und nach immer tollkühnere Kunststücke. Dem Charakter der Volksmusik entsprechend fand Bartók es schwer zu entscheiden, wie er beide Rhapsodien abschliessen sollte. Szigeti behauptete, dass sein Manuskriptexemplar der ersten Rhapsodie 39 unveröffentlichte Takte enthielt, und selbst die veröffentlichte Partitur bietet eine Auswahl von zwei Abschlüssen (die vorliegende Aufnahme verwendet den ersten, und Bartók und Szigeti nahmen das Stück zweimal mit dem zweiten Abschluss auf). Die zweite Rhapsodie begann ihre Existenz ebenfalls mit einem längeren Abschluss, der bei den frühen Ausgaben ausgedruckt wurde, ehe er 1945 zur hier gehörten Version überarbeitet wurde. Für die Kontraste haben wir der fruchtbaren und loyalen Einbildungskraft Szigetis zu danken – oder mit seinen eigenen Worten „einen Geistesblitz, den ich 1938 hatte“, der dazu führte, dass Szigeti den Jazzklarinettisten Benny Goodman überredete, bei Bartók ein Trio in Auftrag zu geben. Ursprünglich was eine weitere Rhapsodie im Lassú–Friss-Format mit zwei Sätzen geplant, wobei jeder Satz auf eine Seite einer 78UpM Platte passen sollte. Es war tatsächlich in dieser Former, dass das Werk angekündigt und zum ersten Mal im Januar 1939 in einem New Yorker Konzert von Goodman, Szigeti und Endre Petri vorgetragen wurde. 1940, als sich Bartók Goodman und Szigeti zu einem Carnegie Hall Konzert und einer Grammophonaufnahme anschloss, besass das Werk seinen heutigen Titel (den Bartók und Szigeti eines Abends in der Park Avenue zusammen entschieden hatten) und, noch weit wichtiger, seinen zentralen „Pihenö“-Satz (wörtlich „Ausruhen“; in diesem Fall eine evokative nächtliche Gamelans koloriert werden). Clownerei ist selten weit entfernt bei Bartóks Musik trotz ihres überstrengen Rufs. Zu den ausgesprochenen Scherzen in den Konstrasten gehört eine unverkennbare Parodie eines ablaufenden Trichtergrammophons im ersten Satz – vielleicht eine schelmische Anspielung auf die Auftragsbedingungen für das Werk, verbunden mit Erinnerungen an Bartóks Jahre, in denen er Volkslieder aud Wachszylinder sammelte? Ebenso kann die verstimmte Geige, die das Finale eröffnet, weitgehend bäuerliche Zoten bedeuten, aber sie könnte auch ein mokanter Hieb auf Saint-Saëns sein. Wenn die Burleske richtig in Schwung kommt, geht der Geiger zu einem gut gestimmten Instrument über, während die anderen buchstäblich die Daumen oder Finger drehen und eine banale kleine Ostinato-Phrase ad libitum wiederholen, bis der Geiger bereit ist fortzufahren. In der Mitte des Finale-Klamauks liegt jedoch eine von Bartóks schwermütigsten Inspirationen, die einem lange verfolgt, eine ausgedehnte lyrische Episode, die im „bulgarischen“ 13/8 Rhythmus mit der Aufteilung 3+2+3+2+3 gesetzt ist – tatsächlich ein bezaubernder kunstvoller Rumba. Für den grössten Teil des Jahres 1943, in dem er isoliert und unglücklich in den USA lebte, war Bartók gefährlich krank und hatte Fieber, dar wahrscheinlich des Ausbruch seiner tödlichen Leukämie bedeutete. Die diskrete Hilfe von Szigeti und anderen ermöglichte ihm einige Ruhe und finanzielle Sicherheit, und als der Herbst kam und er sich etwas erholt hatte, hörte er den jungen Yehudi Menuhin sein zweites Violinkonzert und die erste Violinsonate in getrennten Konzerten in New York speilen. Bartók war überglücklich, nicht nur, weil er überhaupt seine Musik traf, rief er aus, dass er immer gedacht hätte, Musik erlebte solche Vorführungen erst lange nach dem Tod des Komponisten. Menuhin gab unverzüglich ein Soloviolinwerk in Auftrag, und Bartóks Gesundheit stabilisierte sich über den Winter hin genügend, so dass die vorliegende Solosonate bis 14 Marz 1944 vollendet werden konnte. Diese und das dritte Klavierkonzert waren die letzten beiden Werke, die Bartók zum Abschluss brachte; bei seinem Tode im Jahre 1945 waren beide Werke noch nicht vollständig für eine Veröffentlichung redigiert. Bartók hatte den Trost, Menuhin in der Première für die Solosonate, „einer wundervollen Darbietung“, im November 1944 zu hören, nur ein paar Tage vor einer anderen grossartigen Première, der seines Konzerts für Orchester. Mit ihren vier Sätzen ist die Solosonate eins der grössten musikalischen Risiken, die Bartók je eingegangen ist: Mit seinen eigenen Worten nach das Première; „Ich fürchtete, sie sei lang. Aber es war in Ordnung, wenigstens für mich.“ Als Bartók „Tempo di ciaccona“ spezifizierte, ging er das zusätzliche Risiko ein, den ersten Satz nicht buchstäblich zu einer Chaconne zu machen (er folgt nur dem Chaconne-Tempo), sondern zu einer grossangelegten Sonatenstruktur. Wie in den früheren Jahren mit Székely und Szigeti liess Bartók Menuhin einige freiheit in den Details der Ausführung und bot einige alternative Interpretationen, besonders im Finale, wo eine umfangreiche Passage entweder mit Vierteltonintervallen oder mehr traditionsgemäss mit Halbtönen gespielt werden kann. Menuhin wählte letztere, und diese Interpretation wurde in der Veröffentlichung nach Bartóks anfängliche Vierteltonversion wieder zugänglich geworden und ist jetzt in der vorliegenden Aufnahme zu hören.